Dr. Johnson received his MD from Northwestern University and his MPH from the University of North Carolina-Chapel Hill. He is Chair of the Department of Family and Preventive Medicine, and also Paul Seavey Chair and Chief of the Division of General Medicine and Geriatrics. 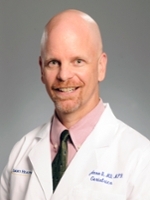 He is the Atlanta Site Director and Associate Director of the Birmingham/Atlanta VA Geriatrics Research, Education, and Clinical Center (GRECC). He also serves as Physician Lead for Emory Primary Care. Dr. Johnson's research focuses on older adults in general, and specifically on interventions that improve quality of life and well-being in those with chronic conditions such as urinary incontinence. Dr. Johnson is a co-instructor for the Epidemiology of Aging course (Rollins School of Public Health) and attends at the Atlanta VA Medical Center in the geriatric medicine bladder dysfunction clinic.